There were over 300 leper hospitals in Medieval England. Mostly founded between the 12th and 13th centuries, they amounted to nearly a quarter of all hospitals and formed a key element of the social and religious landscape of the Middle Ages. Yet despite a wealth of major historical works on leprosy, comparatively little archaeology has been undertaken on leper hospitals. Excavations at St Mary Magdalen,Winchester, are seeking to readdress the balance with some of the most extensive investigations of a Medieval leper hospital. Leprosy, now commonly known as Hansen’s Disease, is a devastating disease that can inflict extreme physical deformity and discomfort on its victims. Today, we understand the root causes of the disease and, crucially, can treat it. In the Middle Ages, however, its appearance often provoked considerable misunderstanding. Definitions of leprosy changed dramatically between AD 1000 and 1500, and the disease was often a ‘catch-all’ for a wide range of skin conditions. Thus Medieval perceptions of lepra probably differ significantly from those of modern Hansen’s Disease. ‘Leper’ is still a word that is used pejoratively in common parlance, music, literature and film. It conjures images of the unclean outcast, ringing a bell to warn against physical contagion and spiritual pollution, and doomed to live out his or her days separated from family, friend and community. Their hospitals, we are led to believe, were consigned to the edge of towns and cities, exerting a physical and psychological effect on the urban landscape, and marking the boundaries of Medieval urban society. Over the last few years, however, the idea of the Medieval leper as an outcast has been challenged by both French and English revisionist historians, and, more recently, by the archaeological evidence itself. The belief that Medieval lepers were segregated from society ultimately stems from Biblical sources. Here, Levite laws concerned with ritual impurity stated that anyone with signs of lepra were to be ‘led’ or brought to a priest, who would consign them to live ‘outside the camp’. The repercussions of this command seemingly resonated across Europe, becoming enshrined in various laws and canons, sealing the fate of many afflicted by the disease. Such influence may be found, for example, in Canon 23 of the Third Lateran Council (1179) which stated that lepers should not dwell among the healthy. The edict, which prohibited lepers from living in towns or cities, naturally required the majority of leper hospitals to be founded on the outskirts of urban areas. This has entrenched traditional views of lepers being segregated from society. Yet attempts to understand Medieval perceptions of leprosy — both physically and spiritually — must be approached cautiously. Modern notions of Medieval fears of a contagious disease that warranted formal segregation, and a spiritual stigma linked to sin, have been moulded by Victorian scholars. They took their lead from Biblical sources rather than an independent analysis of the actual experiences of Medieval society. As fears of contagion may not have been common until at least the late 13th century, many earlier leper hospitals should be seen more in terms of charitable institutions for the incurable than isolation wards for the contagious. Leprosaria were recipients of public and civic charity as well as concrete expressions of ecclesiastical and urban responsibility. In practice leper hospitals were situated on the outskirts of town for reasons that had more to do with the availability of land than segregation. Moreover, extra-mural roadside locations were well-suited for the collection of alms that provided an essential source of income for many foundations. 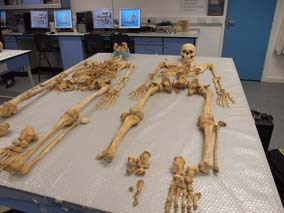 At Winchester, current archaeological work is beginning to shed light on the origins and early development of a Medieval leper hospital, as well as to challenge long-standing myths about the treatment of lepers. In 2007 the department of archaeology at the University of Winchester initiated the Magdalen Hill Archaeological Research Project (MHARP), directed by Dr Simon Roffey and Dr Phil Marter, with the aim of studying the history and development of this former Medieval leper hospital and later almshouse of St Mary Magdalen. The site, which also forms the basis for the archaeology department’s field school, is located on the outskirts of the Medieval town suburbs, some 1.6 km east of the City centre. The first reference to the site is in the 1148 Winton Domesday, which refers to ‘lepers on the hill’. It is now clear, however, that a community of lepers were being cared for on the hill from a much earlier date. Excavations have revealed several phases of substantial pre-12th century occupation, consisting of timber structures in the form of beam-slots, pits and post holes (Phase 1). Directly to the south lay an associated cemetery containing burials that both respected the timber buildings and in many cases were aligned with them. The cemetery contained a range of individuals buried in neatly spaced rows of carefully carved graves. Most of the burials display signs of leprosy, with some also afflicted by tuberculosis, hydrocephalus, disability and malnutrition. The dead include men, women, children and a neonatal burial. C14 dates from one individual suffering from leprosy indicate a date of cal AD 980-1060 (65% probability). A further sample corroborated these findings by giving a date of cal AD 890-1040 (95% probability and 90% within AD 940-1040). 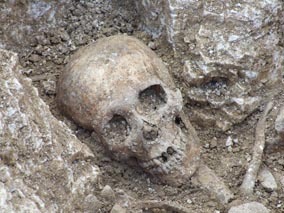 This burial may therefore represent a Pre-Conquest burial, and by association a hospital of surprisingly early date. If so, it would be the first hospital known inBritainsince the Roman period, and the only Medieval foundation pre-dating the Norman Conquest. A C14 dating sample from another part of this cemetery shows that it continued in use after the conquest. A pilgrim burial, one of the latest additions to the cemetery and possibly buried in a prominent position close to the north door of a new chapel, suggests the burial ground was still in use, at least in its later phases, during the mid-12th century. As well as providing potential evidence for a precociously early leper hospital, the findings have also challenged traditional views that lepers were treated as outcasts by Medieval society. Investment in substantial buildings, both timber and masonry, including an infirmary and chapel, indicates that the physical and spiritual comforts of the inmates were well provided for. It is in death, however, that lepers seem to have been afforded the highest level of respect and dignity. The cemetery graves, which contained a considerable quantity of leper burials, comprised a series of neatly cut anthropomorphic graves with carved head niches. Very few of the graves intercut, which is significant as it suggests that they were marked. The age range of the cemetery is also unusual. There were higher numbers of individuals dying in adolescence or young adulthood than would be expected in a normal attritional cemetery from the pre-Industrial period. This is most likely a reflection of the severity of illness afflicting those within the hospital. As noted, one of the later burials in the cemetery contained an individual with no sign of disease and holding a scallop shell, probably representing the burial of a pilgrim, as the shell is a symbol of pilgrimage to the shrine of St James at Santiago de Compostela, Spain. This was an individual of some prestige, means and religious sensitivity. Importantly, this was also a man who chose to be buried among lepers. Overall, the excavated evidence indicates the presence of an institution dedicated to the welfare of individuals afflicted with acute illness and disease. This was a place where the community were afforded a degree of quality of life and status that runs contrary to traditional perception of lepers and their social circumstances.